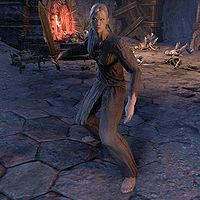 In Coldharbour, she led the Soul Shriven in an uprising against their captors, and together with the Vestige, they fought their way to save Lyris' friend and ally, the Prophet. She offered herself in place of the Prophet to enable him and the Vestige escape from the realm. They eventually returned to save her, and the three banded in a quest to save Tamriel from the invasion of Molag Bal. Esta página foi modificada pela última vez à(s) 19h33min de 1 de março de 2015.